As a card-carrying member of this imagined Theater Gestapo, I have a couple of questions: if such plays are so unfashionable, how come they’re so widely produced – here by a company so young they could almost be the play’s children? And, if they’re so deeply not-allowed, how come they’re so warmly received? 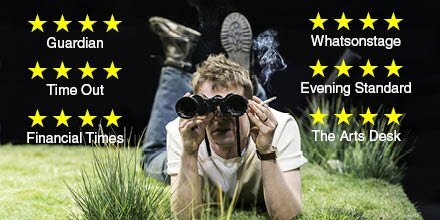 (Four stars in the Guardian, Time Out, Financial Times, WhatsOnStage, Evening Standard, The Arts Desk, etbloodycetera.) Indeed, were any of these accusations remotely true, how in God’s name would we account for the deeply fashionable Annie Baker? So, yes, let’s start by scotching this idea that there’s any agenda here. All that we have now is an age where it is sometimes accepted that there might be more than one way to stage a play, that “theatre” isn’t just “plays”. I don’t think there’s anything beyond that. I mean, sure, there’s politics: it would, arguably, be unusual to see a play written now, set in the North of England, which only had white characters, as there are here. Or with only one woman to three men. But I’m sure it still happens. More than I notice, too, no doubt. The stated politics of the play – and its interest in “ordinary people” – are clearly on-message. And the fact that it hails from 1977, talks about the nationalised British Steel Industry, prophesies the necessity of it, notes the potential for environmental harm. Oh, yes. In this respect it’s positively “relevant”. It’s like Annie Baker got herself a Tardis. In fact, what issues I had with Alice Hamilton’s mostly faultless production sprang largely from the failures of naturalism, rather than from the naturalism itself. As I think we’ve established across about a million reviews of Katie Mitchell, I really don’t have a problem with naturalism. 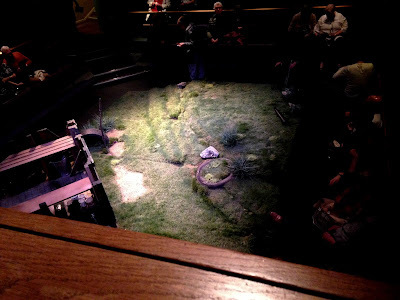 Indeed, I find the idea of the theatre diorama, which is essentially what we have here, with the little grassy plot surrounded by audience, strangely appealing. In the abstract. Look, I found it so pleasing that I even took a photo*. The flip-side of finding naturalism pleasing, is finding oneself getting incredibly nit-picky, and finding all deviations from it incredibly distracting. It seems like one reasonable definition of naturalism is that it replaces directorial/dramaturgical comment with all the necessary detail. As such, it seems reasonable to wonder when this production of the play is set. It seems to still be 1977, but a modern dress production, which is a curious thing. Similarly, you wonder if all the accents are really as authentic as they might be. Are they also period-accurate, as well as place-accurate? Are they consistent? Etc. And you look a lot more at the lights. And at the grass. Is it *meant* to be foregrounding the unreality of the scene? Is the decision to have only the briefest shiver when two scenes are set overlooking the North Sea in the middle of the night a “directorial wave”? Where is all the light coming from in this night time scene? How can a lighting designer really hope to recreate full daylight in-the-round? Etc. Am I convinced by the script? Not particularly. But I’m happy enough to be in a tiny, unfashionable minority on this. There’s been such a successful effort to canonise Holman that it would be beyond churlish to object. I completely get why people are into his plays: they’re quiet, and personal, and personable. To object makes one sound like all one wants in theatre is big bangs and loud, impersonal noises. And, while I do like all those things very much, it’s more that I just prefer other writers’ quiet plays. Or that haven’t yet seen the production of a Holman which properly sells the work to me. Still, no harm done. Lovers of the plays of Robert Holman can see one of them, produced with middling attention to detail, until 2nd April, in Richmond, London. *He's talking about how German Skerries came into being, so "this sort of play" is presumably "plays like German Skerries".